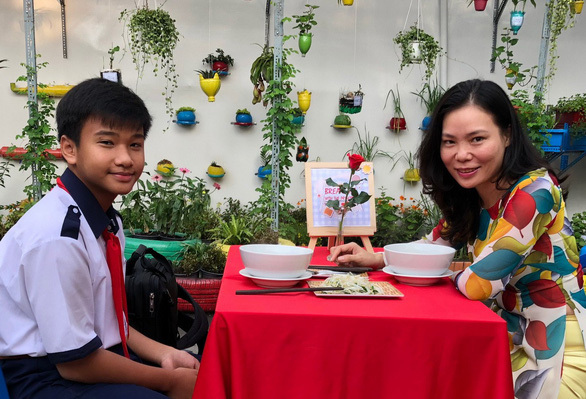 At a middle school in District 1, Ho Chi Minh City, one student will be chosen to have breakfast with the schoolmaster every Tuesday as a prize for their achievements. “Breakfast with the schoolmaster” is a program at Minh Duc Middle School, where the female principal Tran Thuy An will choose one outstanding student every week to eat with her at the school’s cafeteria on Tuesday morning. During the breakfast, the schoolmaster requires the students to speak in English while getting to know them. The chosen participants can invite their parents to participate as well. For students, having breakfast with the head of the school is not only a regular meal, but a prize, a memory, and something to be proud of. “I was awarded with the special prize for attaining the highest grade point average of my grade, and there is no greater honor,” Gia Huy, an eighth grader, said. “When I came home and told my mom, she did not even believe it was true,” he added. During the weekly ceremony held every Monday morning, An will announce the name of the student chosen to have breakfast with her the next morning, with students holding their breath in the hope of hearing their names called. Those students who perform well in studies, sports, and recreational activities, are candidates for the program, according to the schoolmaster. After the announcement, a formal invitation will be handed to the student in front of everyone else in the school. Tran Thuy Nhat Khanh, a ninth grader at Minh Duc, was chosen for the “Breakfast with the schoolmaster” program on one Tuesday morning in September. “Even though it happened nearly three months ago, I still get excited when I think of it,” said Khanh about the morning she will never forget. As Khanh was sitting in the classroom, her classmates told her the principal was looking for her, she recalled. Surprised, perplexed, and nervous, she went to see the schoolmaster wondering what she could have done wrong. “I was very impressed with your speech at the beginning of the new academic year ceremony as you did not need any notes,” the schoolmaster said to Khanh’s surprise and excitement. “Breakfast with the schoolmaster” aims to encourage students to perform better, while allowing the principal to spend time and talk to her students. Moreover, the young schoolmaster insists on speaking English with her students so as to give them an opportunity to use the language and master it. Parents joining their children in the special breakfast can speak in Vietnamese and the students will act as interpreters. During the conversation, if students make mistakes, An will correct them so that they will be more confident. “Students today are very confident and speak English very well,” the schoolmaster said. An underlined that the time spent eating with students allowed her to get a better understanding of their views. While only outstanding students will be chosen for the ‘breakfast’ program, An also runs another program called “Work in the garden with the schoolmaster,” which is eligible for all. Thanks to both programs, she can be more involved in students’ experience as she encourages them to put more efforts in their studies. “Breakfast with the schoolmaster” is not the only program An maintains at Minh Duc Middle School so as to improve the students’ experience and learning capability. Other activities include many practical and helpful extracurricular activities such as visiting a construction site for a physics lesson or going to the municipal administration office to study civics. All of those activities aim at making lessons and classes less boring while allowing students to implement what they learnt to real life. Minh Duc is not the only school whose students are greatly fond of Tran Thuy An. After many years of managing different schools, the teacher has been known to many for her active personality, creativity, and initiative efforts to renovate teaching techniques. The ‘cute schoolmaster’ won the hearts of students as she left them with unforgettable memories and good impression of always having their best interest at heart. In August, shortly after her appointment as head of Minh Duc, An started making plans, programs, and projects to renovate the teaching techniques teachers that the new school. “Ever since the school had the new schoolmaster, there have been many changes,” one Minh Duc student remarked. An, as the new schoolmaster, established an ‘Invention Room’ for Minh Duc, and the new facility was quick to become the favorite place of most students as they are allowed to create their own products from the given materials there. “Teacher An also created a vegetable garden in our schoolyard with various trees and vegetables,” Huy, one of the eighth-grade participants of “Breakfast with schoolmaster,” said. An said she believes that it is crucial for teachers to make continually changes, instead of staying in their comfort zone, as the society is constantly changing. “No students want to learn by heart, and would rather be encouraged and motivated to innovate and voice their own views,” the schoolmaster said.